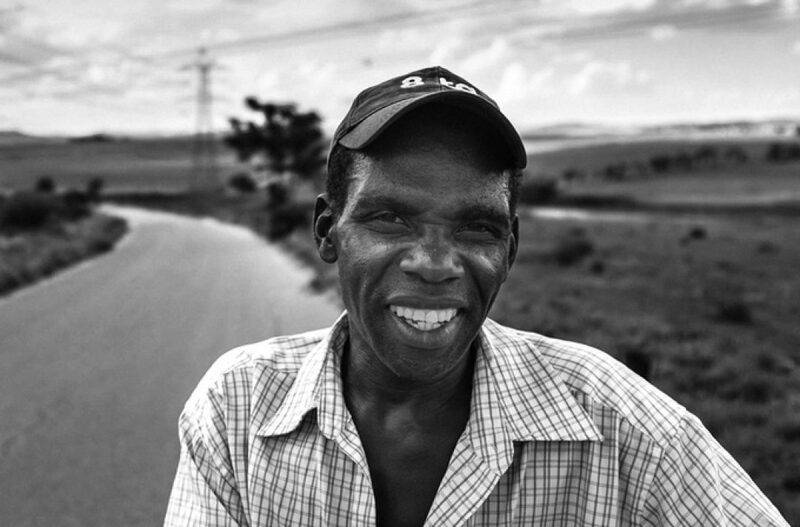 Neill Soden is a photographer currently living in South Africa. He has a Fuji X100 and shares how he makes his portraits with the camera. If I see someone I would like to take a portrait of, I’ll get all my settings ready before approaching them, so I am ready to start shooting at once. I set it with my Custom 2 (B/W) in the Q-menu and get my focus point in the desired position. I will switch to the EVF, as it allows me to see my exposure and lighting as close as possible to the result I will get. My black and white customs setting is B&W+red, highlights to +1 and shadows to +2. Auto ISO is on, so my Fn button is set to ND-filter if it is needed. The key is to do it as quick as possible. Try not to take up too much of the person’s time and not too intrude too much. I will walk up to them with the camera loosely by my side. Getting it pushed straight into their face will not be welcomed by anyone. After I greeted and asked how they are doing, I will ask if I can take the a photo. In the event of there being a language barrier, I will point at the camera and ask if I can take the image. If they happen to say no, I thank them and walk away. I rarely find people to not gladly accommodate you……..
Do you love my work and want to support me? If you’re planning on buying camera gear, you can check out above-noted links. Prices remain the same for you, but a small percentage of your purchase value is valued back to me. Thank you!